This Fishing Handprint craft is a really fun fish craft for Preschoolers or Toddlers to make! This would also make a great Father's Day, Grandparents Day, or Sunday School craft! Decorate your fish any way you choose, and write a message in the top right corner, for example: "Happy Father's Day", "Teach a man to fish" or "Gone Fishing"
1. Trace and cut out a hand print from construction paper, make sure you include the wrist and upper arm. 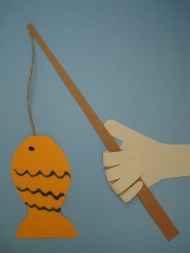 Cut out a long, straight paper 'fishing pole', a short piece of 'fishing line' from your twine, and a colorful fish. 2. Now you'll need to decorate your fish. We used some glitter glue to make fins, but let the kids get creative! Once you've decorated your fish, glue the handprint onto a piece of construction paper (just glue the wrist and palm, not the fingers! ), glue the fishing pole into the palm of the hand, then glue the twine onto the top of the pole, and lastly, glue the fish onto the end of the fishing line. 3. Now all you need to do is glue the fingers around the fishing pole. One by one, glue each finger tip to the palm of the handprint! If you wish, write on a special message!